Jeff, Carter, and Jay Davis. The iceboating community lost one of our most avid stern-steerer sailors, Jeff Davis, on November 18. Our deepest condolences to the Davis family. They always make the effort to attend regattas. Jeff will be missed. His funeral will be held on Saturday, November 25 in Emmetsburg, Iowa. Read his obituary here. I am sorry to report that one of our younger stern-steerer members, Jeff Davis, 42, lost the battle with cancer on November 18. He and his brother Jay restored and sailed the C boat “Flirt” for the last couple decades. Prior to that they both raced DNs. 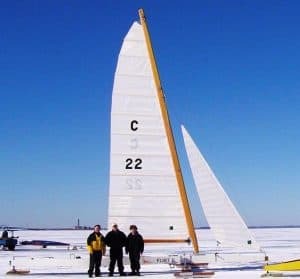 Jeff loved being on the ice and made many trips from Iowa with his brother and his dad, John, to sail regattas with us. 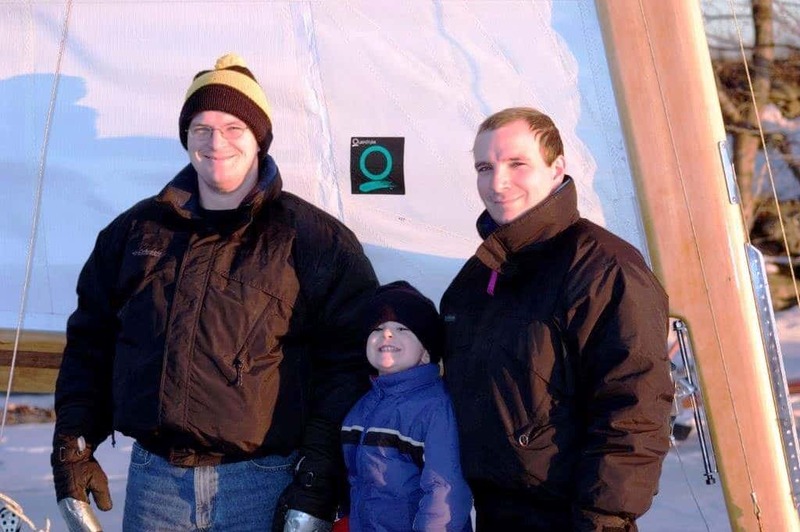 He was looking forward to being well enough to attend the 2018 Northwest and to bring his son for the first time. He will be missed.